How do you followup a hot first release? You amp it up with even more content. 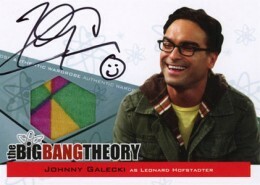 2013 Cryptozoic Big Bang Theory Seasons 3 and 4 does just that with its autograph lineup. 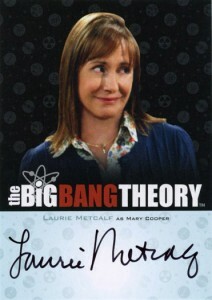 All of the show's main cast return with autographed costume cards. 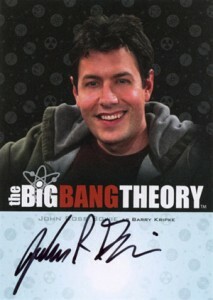 Also signing are several notable guest stars. 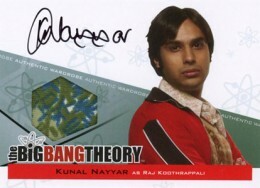 Leading the way are the show's "big five": Jim Parsons (Sheldon), Johnny Galecki (Leonard), Simon Helberg (Howard), Kunal Nayyar (Raj) and Kaley Cuoco (Penny). All signed for the show's first set. 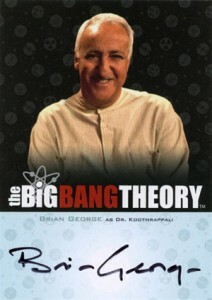 This time around they're all featured on autographed costume cards. 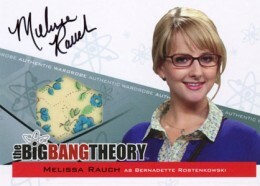 Joining them are first-time signers Mayim Bialik (Amy) and Melissa Rauch (Bernadette). 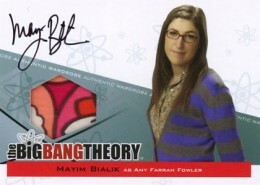 Bialik will likely have a fair bit of appeal outside of Big Bang Theory fans thanks to her starring role in Blossom 20 years ago. 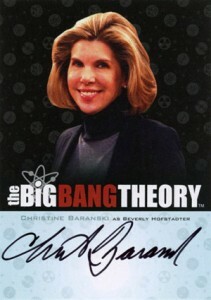 According to Cryptozoic, the autographed costume cards fall approximately one per case. 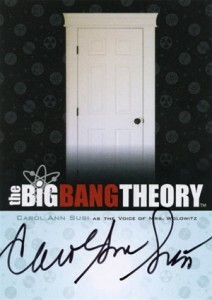 They're not the only 2012 Cryptozoic Big Bang Theory Seasons 3 and 4 signers who've found fame outside of the show. 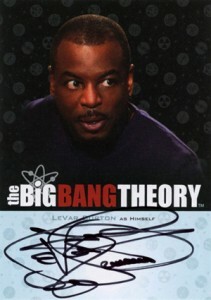 Wil Wheaton and Levar Burton, both of Star Trek: The Next Generation are included. 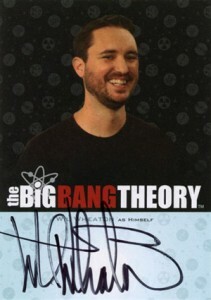 Wheaton, in particular, as been a requested autograph thanks to his recurring role, playing himself. 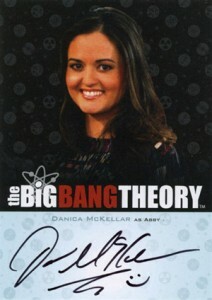 Chances are many collectors had a crush on Danica McKellar growing up. She is well known for her iconic role as Winnie Cooper on The Wonder Years. 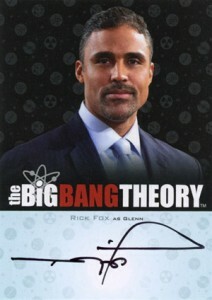 Sports fans can also get in on the action with the inclusion of Rick Fox. The Canadian won three NBA Championships with the Los Angeles Lakers. Several signers also appeared in the first set. 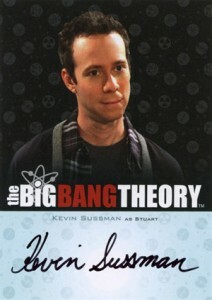 They include Kevin Sussman, Laurie Metcalf, John Ross Bowie, Brian George and Alice Amter. 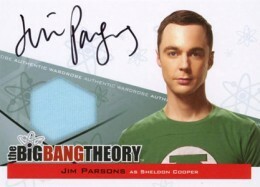 All appear on basic autographs once again, although the design is very different and easy to discern. 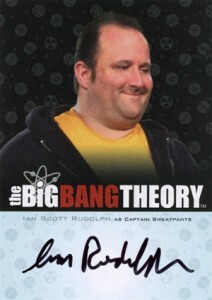 In all, 2013 Cryptozoic Big Bang Theory Seasons 3 and 4 has 20 confirmed signers including the autographed costume cards. Autographs are inserted one per box. Click on the name to shop for singles on eBay. These look just as great as the first series. Always wanted to bust some. Love the show! 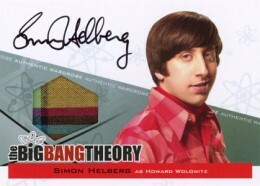 As a fan of the show, I think it is just hilarious that the auto card for Howard’s mom is just a picture of a door.